Combine the paneer and corn flour batter. 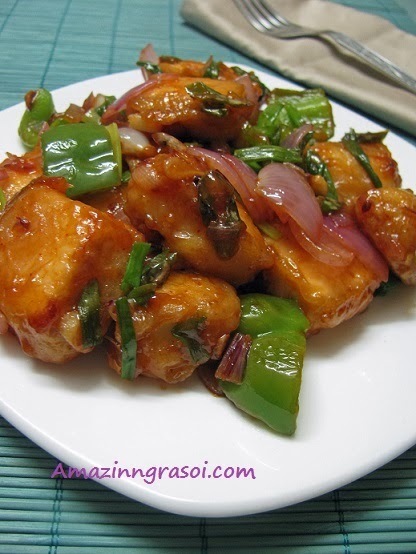 Mix well so that all the paneer are well coated with batter. Heat oil in pan/kadai and deep fry all the paneer on medium heat till it start turning golden brown and keep aside. Add the white part of spring onion and fry on high for min. Add the diced onion and capsicum and fry for 1-2 mins on medium to high heat. Mix 1 tbsp cornflour with 1/ 3 cup water and add to above sauce and cook for a min. 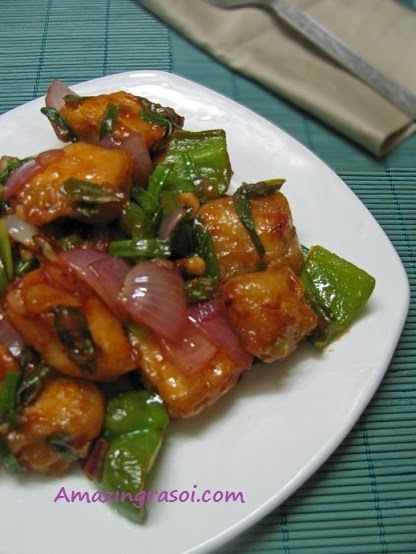 Add the fried paneer and green part of spring onion and mix well. Fry for min and turn off the heat. Serve hot with fried rice or noddles. If using frozen paneer then immerse them in warm water for 10-12 mins before adding in batter.